The Best Rocking Chairs Must Engage the Mind and Comfort the Body Every Day. Rocking chairs that provide deep, relaxing comfort become cherished companions for the rest of your life. The sample of three rockers I've included in this gallery are just such objects. Each Zero-G Rocker is far more than a utilitarian seat. Happy clients say they are the most comfortable chairs in the home, because each one is specifically made to fit them. This level of attention to detail and commitment I provide is almost unheard of in today's fast-paced world. They are painstakingly built with only one goal in mind, your complete satisfaction! So, feel free to investigate these heirlooms and think of the comfort they could offer your own home. This is my flagship rocking chair, the Bonn Zero-G. It's composed of Kentucky harvested black walnut and curly maple. It won 3 prestigious "Best in Show" awards at the Fine Furnishings Shows in Milwaukee, Wisconsin, 2012, 2013 and in Baltimore, Maryland, spring 2013. It also received the Award of Excellence at the Cincinnati, Ohio Winterfair show 2013. "Exquisite craftsmanship inspired by human anatomy and custom designed to fit owner's body, all without power tools." 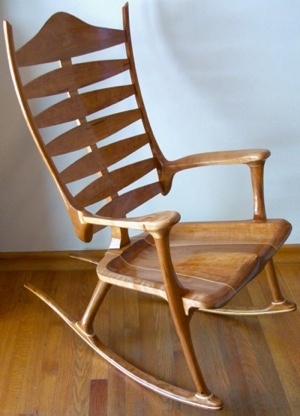 The stunning combination of woods adds a modern yet refined look to this attractive, handmade rocking chair. It was designed and built for a man approximately 5' 10" tall and of medium build. The tilt angle of the spine allows for a fully restorative rocking motion by removing the stress on the back, bringing immediate comfort and enjoyment. The inward-sloping arm rest cradles the forearm beautifully. There is also a very satisfying tactile sensation for the fingers caused by the smoothly rounded over armrest ends. The beautifully contoured walnut seat, complete with maple accents is stunning to view and the most comfortable one you'll ever use. The walnut and maple laminated runners are remarkable strong, light, flexible and sculpted into the legs. "This chair is the most comfortable in the whole house!" This Bonn Zero-G Ladies Edition handmade rocking chair has proven to be very popular with its owner and her children. In fact, many people, not just women, enjoy its shorter stature. 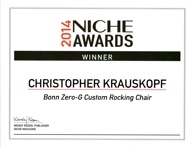 This chair won the prestigious 2014 NICHE Awards competition in Philadelphia, PA. It's made from strikingly rich Kentucky Cherry with maple accents in the seat, runners and back-slat sides. This wood is a favorite because it shows a more intense grain pattern with lovely dark streaks, in contrast to its counterparts in the northeast US. This chair was built for a woman client approximately 5' 6" tall and of average build. The back tilt is approximately 12 degrees from vertical, providing outstanding support for a neutral rocking position. The shortened armrest fits her forearm perfectly and offers wonderful control and leverage. The deeply sculpted seat not only fits beautifully, it shows off the wonderful grain pattern so typical of Kentucky cherry. The elegantly laminated and curved runners are expertly feathered into the legs, providing an outstanding joint both visually and mechanically. 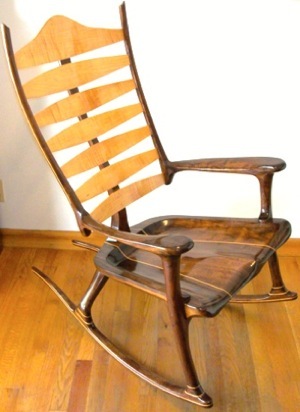 This Bonn Zero-G Senior's Edition rocking chair is a favorite for those who enjoy a more upright rocking position than the previous two chairs mentioned above. 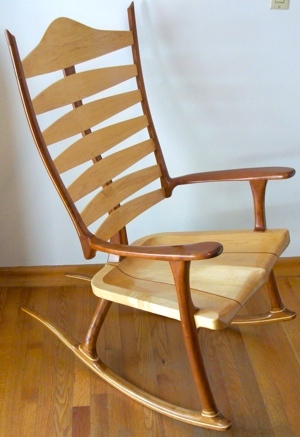 This chair, too, is made from locally harvested Kentucky maple and cherry. It works extremely well for senior citizens who have some lower back issues. The rocker's slightly more elevated stance eases entry and exit, while the simpler arm rests allow easier gripping for arthritic fingers. The arm is slightly flatter and thinner than other armrests too. This promotes a lighter look and feel while still maintaining outstanding comfort and support. 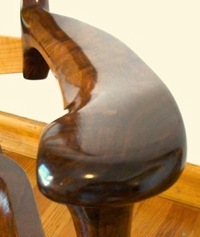 The deeply sculpted maple seat not only fits beautifully, it shows off the vertically laminated center section. While laminating is not necessary here, it is my way of adding visual interest. So, as you can see from these three examples of rocking chairs, my aim is create as pleasurable a sitting experience as possible. Return from Rocking Chairs Gallery to Home Page.